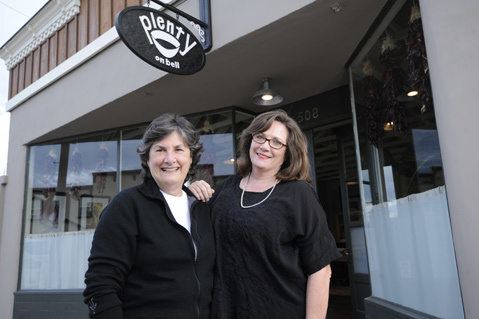 <strong>EDIBLE SERVES YOU:</strong> Carole Topalian (left) and Tracey Ryder founded Edible Ojai in 2002, grew that into a continent-wide magazine network, and are now putting plates where their pens are by opening a Los Alamos restaurant. The menu — for now they’re open for breakfast and lunch, with hopes for dinner once they can get a liquor license (yet more Ghost Rider issues haunt) — blends enhanced, organic-ized favorites from Quackenbush with highlights from Ryder and Topalian’s travels. “We do a polenta and chorizo that’s like a place in Santa Fe, but Jesper has made it his own,” said Ryder, who’s also excited about the Bowl of the Week, which starts with Rancho Gordo beans that are so hearty and delicious that the dish can be finished with anything. That will certainly be the case this Sunday, February 6, as one part of Edible Santa Barbara’s action-packed Los Alamos Day. Ryder and Chef Pascale Beale will teach a cooking and recipe writing workshop while Topalian will lead a food photography class. “Everything will be hands-on, more experiential,” promised Ryder. And that should be plenty for everyone. Open 8 a.m.-3 p.m., Tuesday-Sunday, Plenty on Bell is located at 508 Bell Street in Los Alamos. Call (805)344-3020 or see plentyonbell.com.